Nothing in the black community happens in a silo. And thus when tragedy inevitably strikes, it is often seized upon as an opportunity to engage with larger, more uncomfortable questions. It’s not surprising that the murder of rapper Nipsey Hussle on March 31 has sparked a series of conversations about gun violence, homophobia, and how we mourn a complicated black life. Lost in these conversations, though, is an equally important discussion about black masculinity — who it is afforded to and who ends up dying when we tie toxic ideals to black manhood. We have seen the glorification of gang culture, and how it intersects black masculinity. We have seen it portrayed in movies like “Boyz in the Hood,” and expressed in songs like the NWA classic “F--k the Police.” Black Americans are justifiably tired of the oppressive systems that police America. Nipsey’s story is no different than many we have seen: A young man from the hood tries to have a positive impact, but his legacy is complicated by his unwillingness to give up the homophobia and misogyny that continue to hold so many of us back. A young man from the hood tries to make have a positive impact, but his legacy is complicated by his unwillingness to give up the homophobia and misogyny that continue to hold so many of us back. This is not to say that people can’t evolve. Jay-Z’s past is littered with examples of misogynist and homophobic lyrics; and yet last week, he was publicly lauded by GLAAD as an LGBTQ ally. Growth is good. But we also must remember that the timeline is different for the actual targets of hate. People are dying while others are asking for time to grow. The LGBTQ community is all too familiar with the violent side of black masculinity. In 2016, a black man was sentenced to 40 years in jail for pouring boiling water on a sleeping gay couple. Meanwhile, violence against the transgender community appears to be increasing, with many of the crimes involving black or brown female victims and black male attackers. The words of those who are seen as leaders trickle down — and just like that, someone’s thoughts become someone else’s actions. The past 12 months have provided numerous examples of the fragility of black masculinity. From famous black men calling Terry Crews weak for not fighting back against his sexual assaulter to Kevin Hart’s old homophobic jokes surfacing before the Oscars to the death of two black men at the apartment of prominent Democratic donor Ed Buck, the dots connect. And running through each incident is an undercurrent of homophobia, which of course is also rooted in misogyny. Terry Crews alleges he was sexually assaulted by a man who doesn’t identify as gay. Yet other men like actor D.L. Hughley and rapper 50 Cent questioned if Crews maybe wanted the incident to happen, because he didn’t react in a violent way. Kevin Hart’s old tweets joking about the violence he would commit if he ever had a gay son tie into these same notions. Hart apologized and claims he was only kidding — but Wendell Melton wasn’t. Melton murdered his gay black son, Giovanni Melton, in 2017. Allegedly, he would rather have had a dead son than a gay son. The issue here is that black gay men still aren’t seen as equals. Too often, their blackness is reduced because of their sexuality. The issue here is that black gay men still aren’t seen as equals. Too often, their blackness is reduced because of their sexuality. Nipsey Hussle — who again worked hard to reinvest in South Central Los Angeles — was himself very concerned with the imagery of black men and appeared worried that queer people were attempting to execute a mysterious and negative “agenda.” Such language is often used to criticize LGBTQ people for being too openly proud of their sexual orientation, or even worse, for allegedly influencing others to live openly gay as well. Nipsey was fine with gay people existing — just not joyously, or in public. Meanwhile, two black gay men have fatally overdosed at Ed Buck’s home over the past two years. Where is the widespread outrage from the black community? Where are the marches and protests? Could this lackluster response be related to an unspoken feeling that men like that deserve what they have coming? Queer men and heterosexual men often talk at each other — and about each other — but rarely with each other. Although many of us navigate the same spaces, it is apparently never the right time for this particular conversation. This is why so many of us air our grievances in the aftermath of tragedy. I grew up in a black family. We heard the stories of my uncles running the streets and getting into shootouts. I grew up in a black community where friends of mine joined gangs and used dominance and violence to earn the neighborhood's respect. Social media has a way of making people seem disconnected, when realistically we are all products of our environment and our experience. Colonized to hate and separate based on the ideals of white supremacy — with manhood and masculinity determined by dangerous principles that most often leave black folk dead or wounded, both emotionally and physically. Because the truth is toxic black masculinity kills. 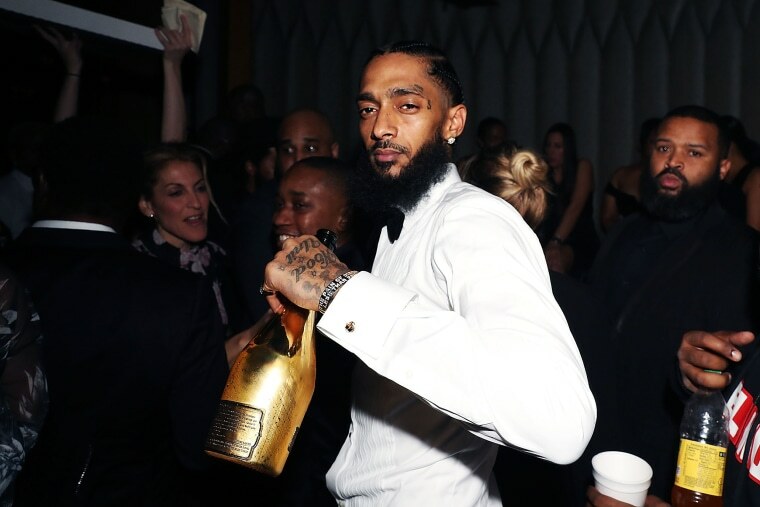 Rumors have circulated in the past few days that Nipsey Hussle was murdered by a man who felt “disrespected” in the rapper’s clothing store following a personal dispute. Masculinity didn’t protect him, and now he’s dead. Well, I’m tired of black death. And I’m tired of so many members of our community — my community — attempting to hold on to ideals that have been proven to cause so much pain and fear.